I GOT IT!!! I think I have finally figured out what God has called me to do! What a relief! I guess my prayers have been heard and He has finally decided to reveal to me my life’s purpose. Ready? Here it is: He wants me to give surf lessons! Yay!!!! Can you believe it? I know, you probably just said, “WHAT!? !” She can’t surf! Does God think that just because she lives in Southern California that she can surf? She doesn’t even have blonde hair! Maybe God is mistaking her for her niece, Karly? Now she’s the cute blonde surfer of the family. Well, my friends, I am no longer a beach bum. I haven’t been one for a while. A few years ago I brushed off my sandy cheeks and decided to have some fun. I learned to surf. It took some time, but I started with the basics, the fundamentals. But I don’t surf any ordinary wave, I surf a much scarier wave. I ride and conquer the waves of destruction and deception on my sturdy surfboard I call TRUTH, defending my faith. So now I’m a surfing soldier for Christ. As a passionate believer with a Christian worldview I have learned that TRUTH will never let me down. In a sea of secularism the constant barrages of skepticism, and false doctrine are aggressive and unrelenting; but I know that with my feet planted firmly on TRUTH I have the wisdom and understanding to take on each swell of attacks. With every crashing wave that fails to shake the foundation of my faith it’s an exhilarating ride that sharpens my skills and prepares me for the next. This is what I want for our youth, my kids, your kids. Being above the darkness that lurks in the waters below is really the only safe place to be. I see so many of our young Christians just sitting on the beach while wave after wave crashes into them leaving them weak, confused and defenseless. They are literally living on a prayer. They call themselves Christian, they say they love God, they go to church, they are told that Jesus died for their sins so they say they believe. Is that enough for them to paddle out? Are we maybe asking too much of our kids when we expect them to believe in God and the Bible just because we tell them to? Are we investing our blood, sweat, and tears into helping our kids build their faith and relationship with Christ on nothing but an abandoned beach when it’s high tide in stormy weather? I know this is Southern California, but come on, these warm Pacific waters pack a powerful punch. By leaving them stranded on an island of godlessness, chaos, and confusion without TRUTH to protect them is it possible that we as good Christian parents are really just setting our kids up for failure? It is all too clear that the environment that our kids are growing up in is drastically different from the one we grew up in. It used to be that if you grew up in a Christian home just believing what you were taught was good enough. We were able to mature in our faith in a time of calmer seas and low tides. We were able to frolic in the sand and never really worry about learning to surf the waves. The storms attacking our shores were few and far between, but the violent waves that seem to be breaking right on the shoulders of our kids are rolling in from every direction. The youth of today are dragged further and further away from us in the overwhelming currents of culture and we just sit by and watch as the precious years we have invested in their faith, going to church, praying, and trusting in God is all washed away. All the teachers, professors, friends, celebrities, rap songs, Facebook posts, YouTube videos, twitters, books, movies, or even just the signs on the side of the road that attack, disprove, contradict, demean, insult, disrespect, reject, or scoff at Christianity are part of the endless set of small but powerful swells that keep pounding into them until they no longer have the strength to stand anymore. And just like that, they’re swept out to sea. It is then that we are left with trusting in Proverbs 22:6 that says if we teach our youth about the way they should go; even when they are old they will not depart from it. This verse gives us peace in that there is hope that no matter how lost our kids may get they will never truly depart from it. But wouldn’t it be nice if we could keep our kids from getting lost to begin with? It’s time to teach them to surf! It’s time to lay out what they need to know in black and white. I want to help these kids build a strong foundation of TRUTH that they can stand on and start riding the waves instead of getting beat up by them. These kids want it, they are begging for it. I know, I’ve been to the beach lately and heard them asking. They are very smart and would love the opportunity to learn what makes the TRUTH true. It’s time to raise up strong Christian surfers, preparing them for the stormy waters that are coming their way. Let’s teach our kids this exciting sport. Let’s show them how their faith can be fun even in the middle of a hurricane. It’s the solid fundamentals, biblical doctrine, the basic truths of the Christian faith that will be the surfboard of TRUTH that will give our kids the ability to carve out their place in this watered down world. Our kids need to know why they believe. They need to be able to defend their faith, live with confidence, and passionately fulfill their purpose in life being a bright light in this dark world. The new generation of strong Christians need to be armed with the understanding and knowledge that there is an overwhelming amount of evidence for them to examine; historical evidence, archeological evidence and inspirational evidence along with all the biblical evidence that is full of consistencies, witnesses, prophecies, revelations, codes, miracles and the list on. No longer do they rely on blind faith. We have the goods to back it; and let me just say, “Thank you. God!” With this information and instruction they will feel confident enough to surf even the North Shores of life, victoriously conquering the massive waves and the strong riptides of deception, doubt and confusion. Moving forward with a Christian worldview will give them a new perspective and the storms wont look so ominous. Everything makes sense when you are dropping in for the first time and you feel the rush of adrenaline as you start defending your faith. We can’t allow our kids to become beach bums. Let’s give them the gift of TRUTH to carry with them at all times, teach them to surf like pros, and then when the tsunami hits, they’ll be hangin’ ten. 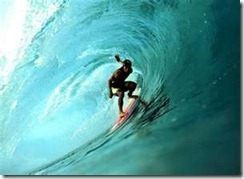 Surfin’ the waves of life all for His Glory!!! Taci, may you continue to make waves, and Pray!